Zip World won international acclaim when it opened Zip World Velocity at Bethesda in March 2013. It includes a pair of zip lines, a mile long, where riders can exceed 100mph, 500ft high and experience the nearest thing to flying. The newest member to Zip World, Titan, opened June 2014 at Llechwedd Slate Caverns, near the historic slate mining town of Blaenau Ffestiniog. This is the first 4 person zip line in Europe and the combination of Velocity and Titan makes North Wales the zip line capital of the world. Zip World Titan is also home to Bounce Below, a unique subterranean experience! 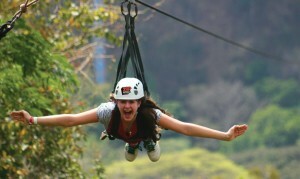 It is not just the exhilarating thrills of the zip lines that will leave you breathless. The scenic 45 minute drive between Velocity and Titan is breathtaking and is an experience in itself.